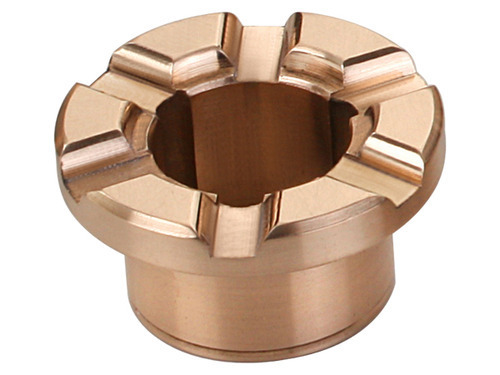 Bronze Collar Bushes offeredprovides for durable usage support and can be made available by us in options of different bronze metal grade so as to perfectly match up with the specific demands of the customers. Further, these bushes can be offered in different hardness of HB90 to 120 as well as in temperature limit of -100 to 200oC. Some of it features include available with different load capacities of 60N/mm2; suitable for use with low, middle and high loads; optimum wear resistance performance; suitable for use in low or high temperatures. Established in the year 2005, at Rajkot (Gujarat, India), we “Parth Industries” are a leading manufacturer and trader of a superior quality range of Bearing Bush, Counter Bush, Motor Bush, Pump Bush, etc. We are offering all our products under the brand name "Active". Known for high quality products, we manufacture these products using superior quality metal alloy and advanced technology. The products offered by us are acknowledged for features like fine finish, high strength, vigorous construction, precise dimensions, corrosion resistant finish, etc. These products are available in various specifications in order to meet specific needs of our valuable clients. In addition to this, our clients can avail these excellent quality products from us at affordable cost.